October 5, Toronto: Bayshore Healthcare 2015 Leadership Conference. Keynote speaker. October 7, online: HealthSparq webinar. Participant – details TBA. December 2, San Marcos: Texas Hospital Association annual meeting. 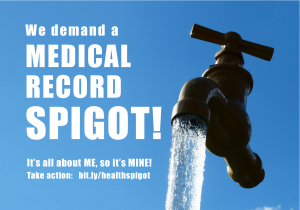 MedCity News – a strong piece about the Data Spigot post (above) by Neil Versel. September 10: Hospital & Healthcare Association of Pennsylvania’s Patient Safety & Quality Symposium, Lancaster. September 11-19: Alaska! Multi-event speaking tour of Anchorage and Soldotna. September 23-27, Palo Alto: Medicine X. Speaker at Medical Education event.